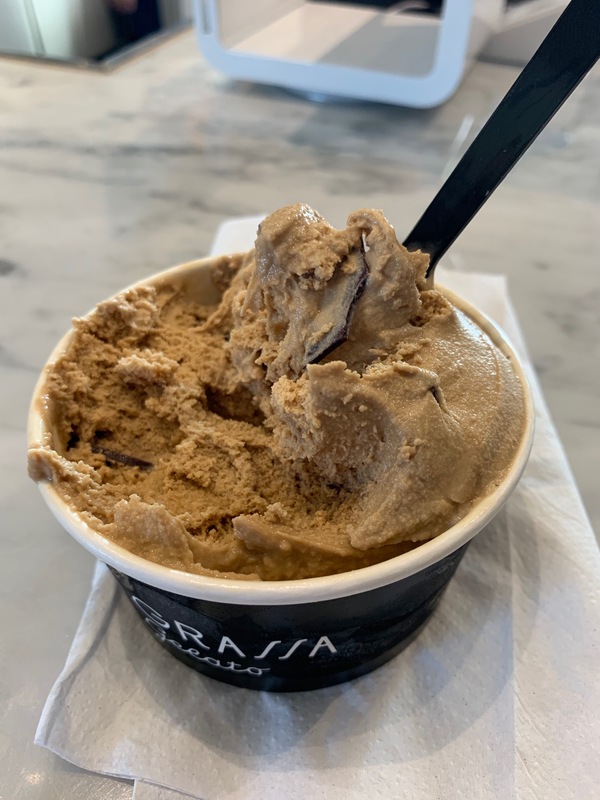 La Grassa Coffee and Gelato – Go There. Try That. I love coffee and sweets. That’s no secret. I’d be hard pressed to pick between the two if someone made me. Most days I can’t articulate clear thoughts (or say words) without coffee so I guess coffee wins. Luckily, I don’t have to pick because La Grassa in Madeira serves quality coffee and homemade gelato! If you’re anything like me, you enjoy your coffee and your sweets together. At La Grassa you can do just that. 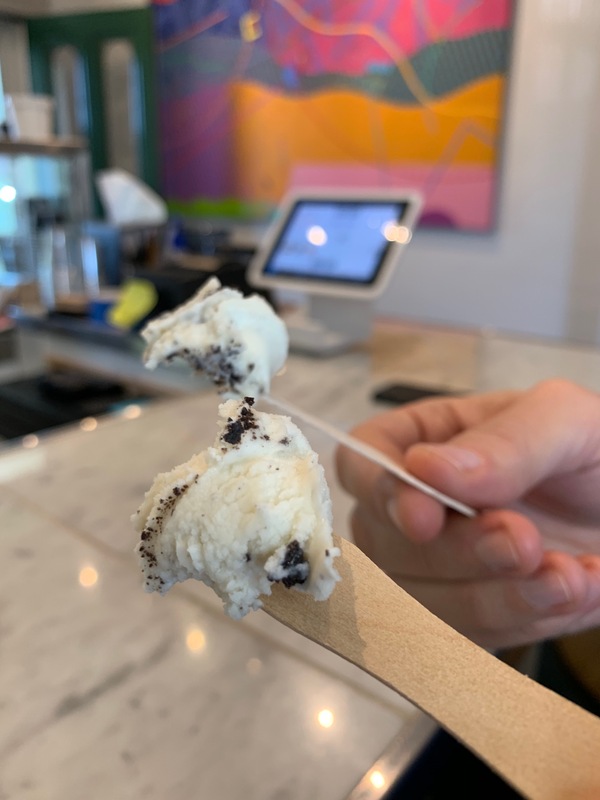 Order one of each, or, get a little wild and try an Affogato (espresso poured on top of vanilla gelato) or some Espresso Chip Gelato! Either way, it’s a taste of sweetly caffeinated heaven. Speaking of caffeine, La Grassa serves Intelligentsia coffee which is a well-known roaster in Chicago. It’s direct trade, exceptionally roasted coffee that the baristas at La Grassa brew with skill. 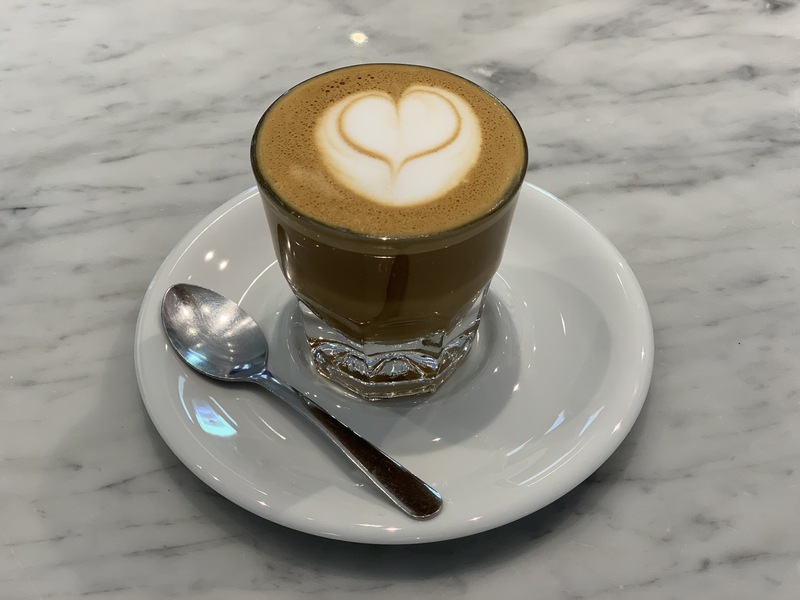 We enjoyed a few drinks on a recent visit; my husband loved his Cortado (espresso mixed with equal parts steamed milk) while I ventured into somewhat familiar territory with my Mocha. Now, I love my mochas. It’s my go-to frou-frou drink. But, I’m a real milk kind of girl; I’ve tried various kinds of nut and soy milks and I just can’t do it. I don’t like the flavor, but even more importantly, I don’t like the texture. I made that very clear when I was asked to try mine with oat milk. 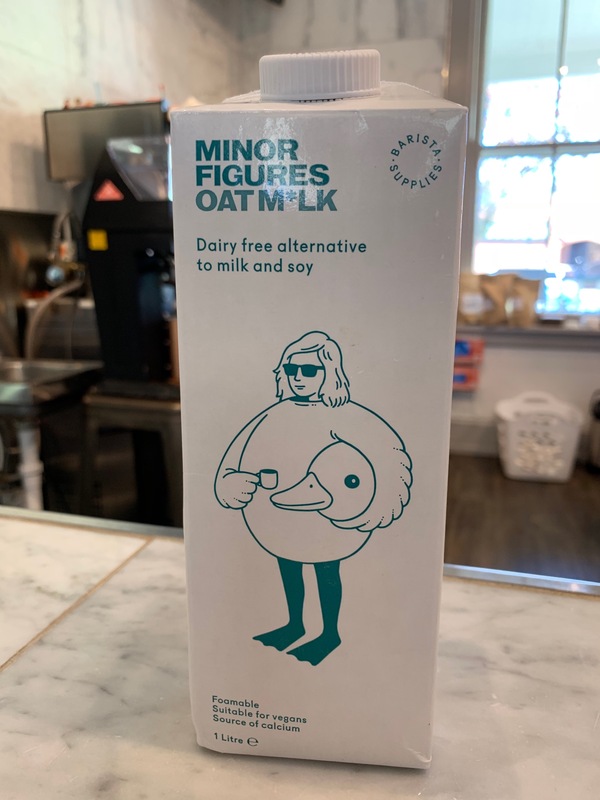 Oat milk?! Gotta say I was hugely impressed. The oat milk didn’t break up in the hot coffee and the consistency was super creamy and rich. If you try to avoid dairy in your coffee drinks (regular or frou-frou), I highly recommend a coffee break at La Grassa. 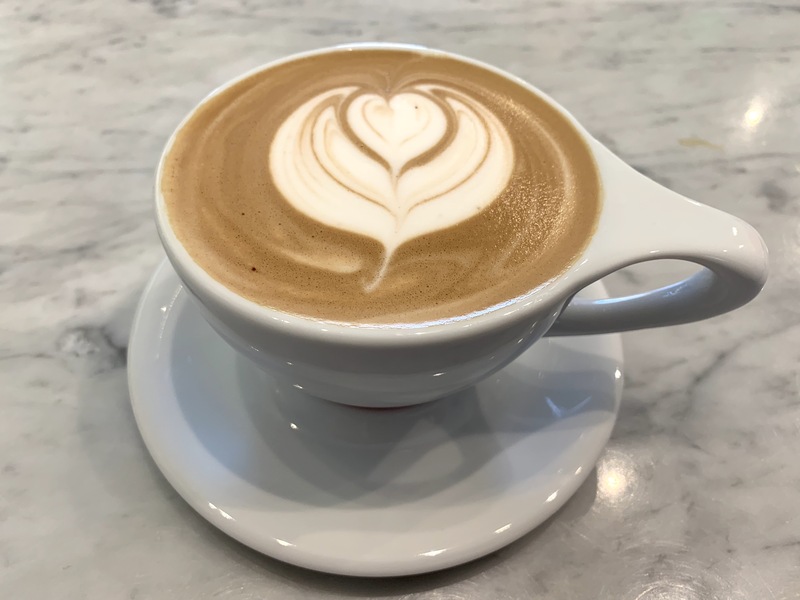 Mocha made with oat milk. Even more impressive than the coffee bar at this sweet little shop in the heart of Madeira, is the gelato which is made by hand using only the freshest ingredients by an owner who actually studied the art of making gelato in Italy! Yep, in Italy. The secret to this gelato, in addition to the skill and knowledge of the maker, is the fresh ingredients. Remember, I only write about places I like and we tasted every single flavor of gelato on that menu. Each was creamy, not too sweet, and a celebration of fresh flavors in subtle ways. From the Apple Cider to the Pistachio, from the Passion Fruit to the Salted Caramel, it was just so good and so refreshing. I loved the slivers of rich chocolate, the taste of actual vanilla beans, and the boldness of real passion fruit. Even their chocolate and caramel sauces are made from scratch! After stuffing ourselves with gelato and coffee, we got a tour of the kitchen (which was clean and highly organized). We were told that the question that drives the business is this: What are we using and how are we using it? I have zero doubts about that. The owner, who studied in Italy, has a manufacturing background which is reflected in his meticulous notebooks of perfectly balanced ratios. Everything at La Grassa is thoughtful. 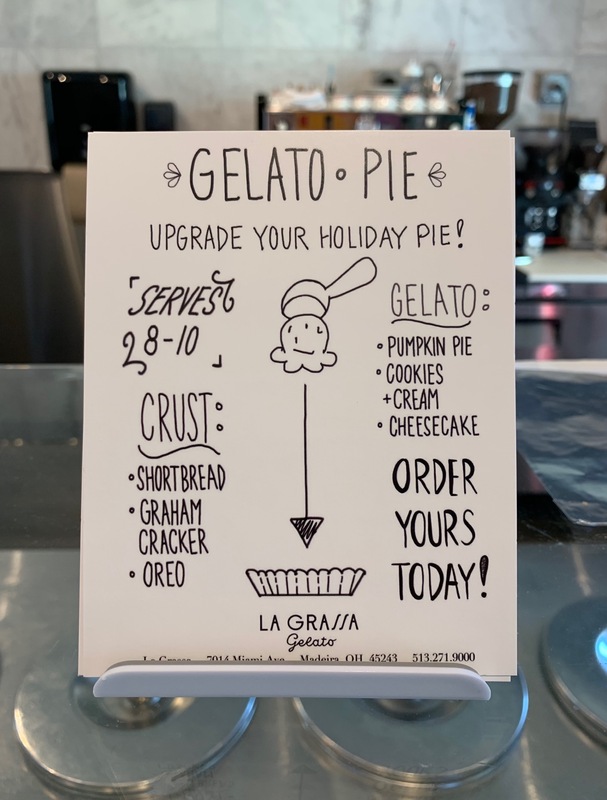 We ordered one of these cheesecake gelato pies for the holidays and it was delish! 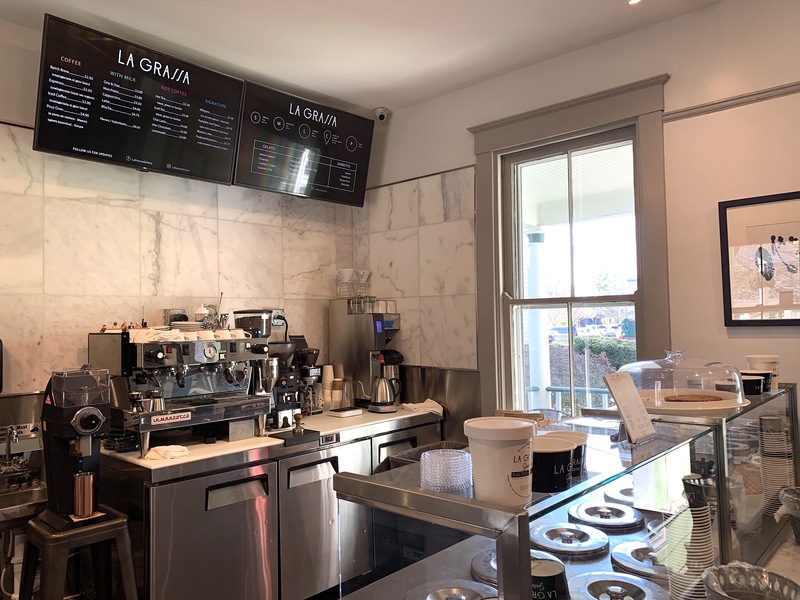 So, whether you stop in for coffee, gelato, or both, I highly recommend a visit to La Grassa. It’s a great location and an even better product. Get your coffee and gelato to go or sit for a while with a friend. GO THERE (La Grassa)! TRY THAT (Espresso Chip gelato, Passion Fruit sorbet, Latte, Cortado)!